With your Real Plans subscription + Whole30 upgrade, you can fully customize your Whole30 Reset to meet your specific dietary and scheduling needs! First, make sure you have your Whole30 function turned on in Settings->Options->Major Settings. Then, head to Settings->Whole30 to get started. The first thing you will do is enter your Whole30 start date. Your subscription begins on the date of purchase to give you time to get familiar with your Whole30 Meal Planner and do your shopping, so you will want to select a start date to begin your Whole30 Reset that will be after you have had a chance to explore the planner and get your shopping done. You will have complete access to your Meal Planner prior to this date, but this is when your Whole30 countdown will begin. The next thing you will do is decide which meals you need Real Plans to plan for you (which meals you will actually be cooking). If you eat lunch out every Wednesday, for example, you will not need a meal planned for Wednesdays and can turn that meal off. You can also plan to double a recipe so you can schedule leftovers on certain days. To turn a meal slot off to show you will not be cooking that meal, simply slide the toggle in that meal slot from green to red. 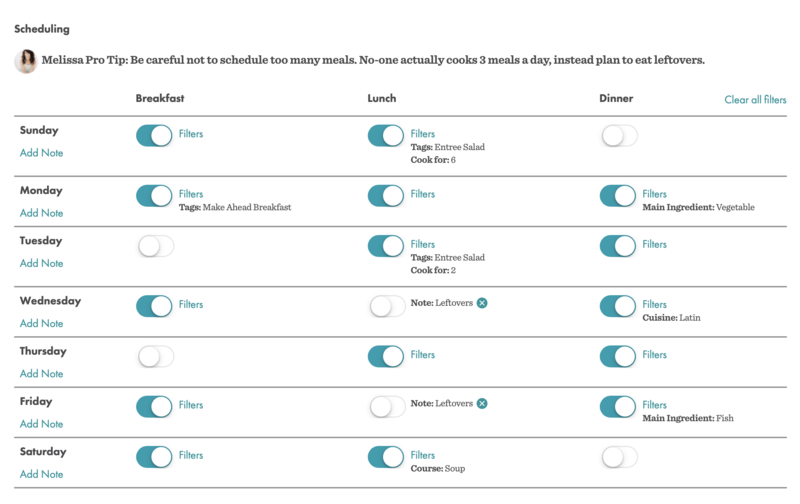 You can also use our Advanced Filters to fully personalize your Whole30 to meet your specific scheduling needs. Please click here to see how our Advanced Filters can help you rock your Whole30! Adding a note to your weekly plan will allow you to schedule leftovers on certain days or remind you that you will be eating out every Friday, for example. Next, you will enter any dietary restrictions you may have. 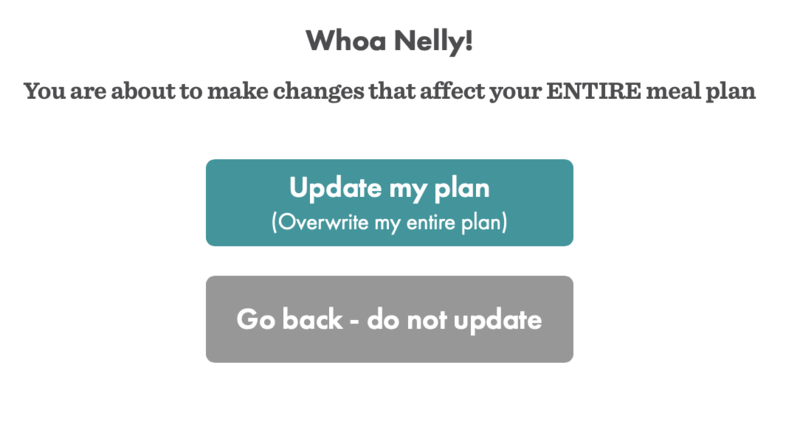 Your Whole30 exclusions will already be preset for you, so you only need to worry about foods you need to exclude due to allergies, intolerances, health conditions, or aversions. If there is a certain food you know you will not be eating, you can exclude it from your plan so it will not show up in your Meal Planner. Simply highlight each food group you do not wish to eat and then click on to send those food groups to theExcludedlist. Should you decide at a later date to include those foods back into to your plan, you can come back to this page and highlight those foods from theExcludedlist and click to send them back to theIncludedlist. Please note that sending any of the preset Whole30 exclusions back to theIncludedlist will mean that you are no longer in compliance with Whole30, so if you are planning to strictly follow Whole30, you will not want to move any of the preset exclusions back to theIncludedlist. If you are not sure what certain food groups are or you need help deciding which ones to exclude, please clickherefor a detailed explanation of each food group so you can make the most informed decision on which foods to eliminate from your meal plan. 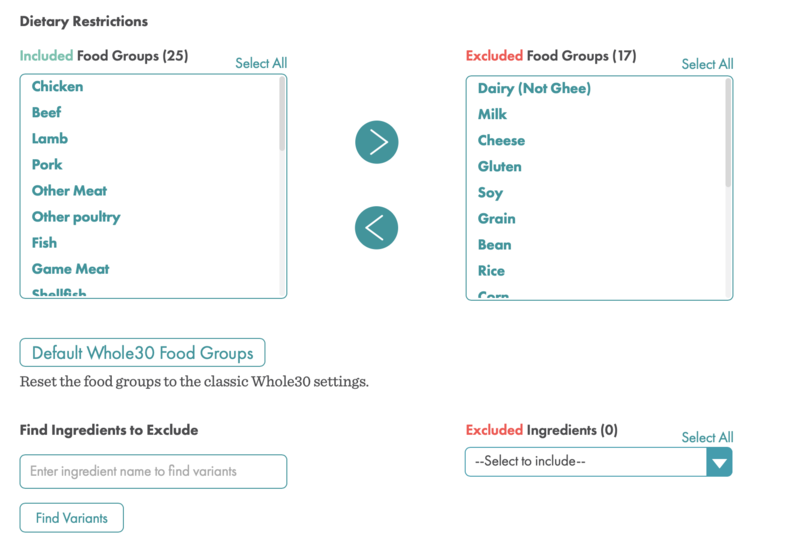 If a food you wish to exclude is not on the Food Groups list as seen above, type the name of the food you wish to avoid in the box under “Find Ingredients to Exclude”, and then click “Find Variants”. This will bring up all the variations of that food that you might see in our recipes. You can manually check each food you wish to exclude or “Select All” to exclude them all. Click on the to send those foods to theExcluded Ingredientslist. Keep in mind that excluding foods does limit the number of recipes you will get on your Meal Planner, so exercise caution here. We recommend not excluding foods for which you have a good substitution or could easily omit. We also suggest not excluding foods that are on ourTop 20 Ingredientslist if at all possible to get the most variety in your Meal Planner. Once you have your schedule and dietary exclusions personalized to meet your needs, be sure to click on to save those changes. Making changes here will overwrite your ENTIRE plan, so if you have already crafted the perfect plan this week or have already done your shopping, you will want to be sure to save or print your plan before making any changes to your Whole30 Reset page. Once you have updated your plan with your dietary and scheduling preferences, you will be taken to your new, fully customized Whole30 Meal Planner!